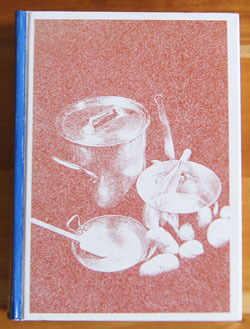 Cookbook #246: The Art of Cooking and Serving with 549 Tested Crisco Recipes, Procter and Gamble Co., Cincinnati, Ohio, 1937. 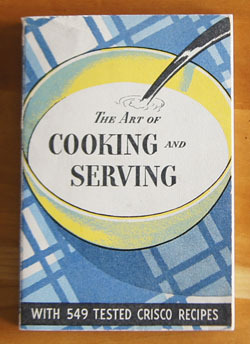 This week is the first time I have read The Art of Cooking and Serving with 549 Tested Crisco Recipes. I know that once I opened it and entered the title and publication date in my database, noting that it “no writing in it; probably is Grandmother’s”, but I didn’t read it. 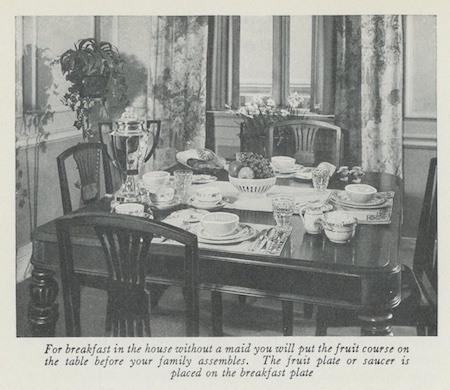 Today I sit down with The Art of Cooking and Serving, expecting it to be glowing with praise of Crisco, much like my 1942 booklet Good Cooking made Easy, Spry, the flavor saver, praised Spry. 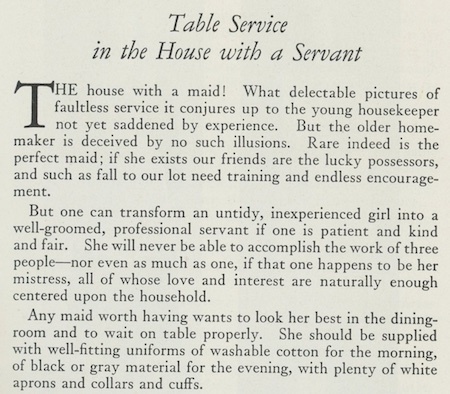 But no, The Art of Cooking and Serving is quite different, and I’ll get into that later in this post. My copy of The Art of Cooking and Serving is in excellent condition. I check for copies online, and find a few, all under $15. 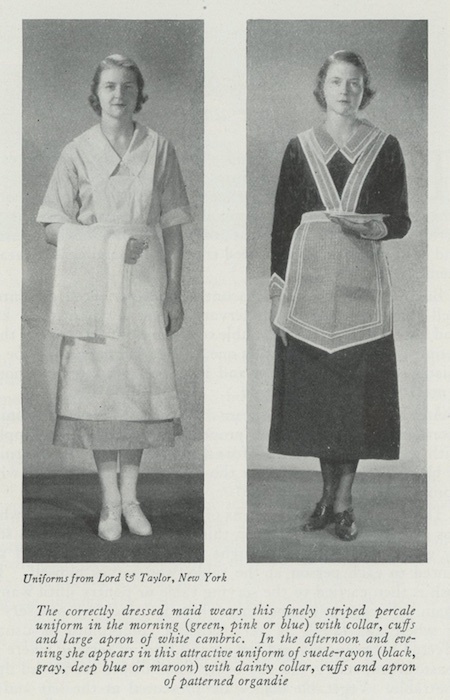 This booklet is available in 1930 and 1931 editions as well as my 1937 edition. It is not available as full text on my go-to site, the Hathi Trust digital library. 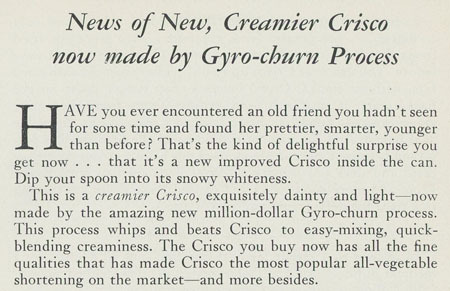 I also learn that Crisco was introduced in 1911 by Procter and Gamble. The brand name is now owned by the J.M. Smucker Company. Okay, let’s peruse this book. It’s 252 pages long, paperback bound, and 5×7-inches in size. There are some color photos, and a lot of black and white photos. 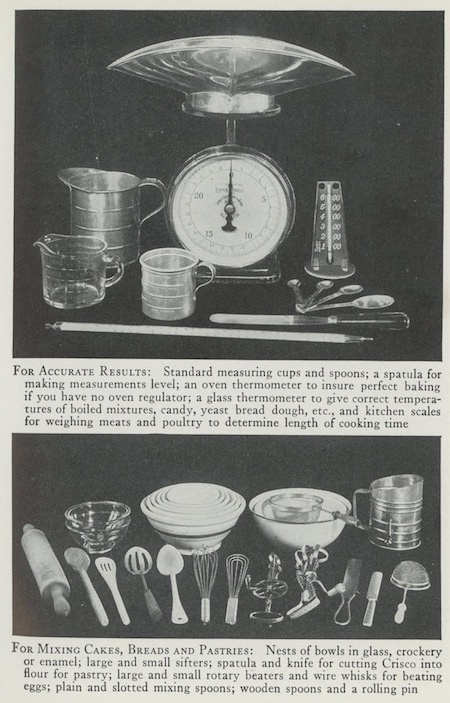 The chapter on “Helpful Cooking Equipment” has several vintage photos. 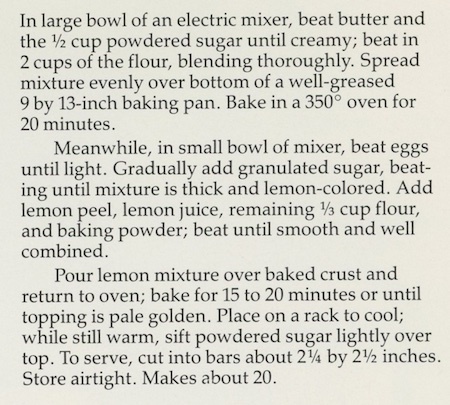 I am kind of surprised that the mixing equipment does not show an electric mixer, since I found that these were introduced to American cooks by the 1930s. “How to Plan Your Meals” is a short chapter on what foods to include in your diet for sufficient protein, energy (fats, starches, sugars), body regulation (roughage and minerals), vitamins, and water. Next, sixteen recipe chapters cover deep-fat frying, soups, cereals, cheese, fish, meat, poultry, salads, cakes, cookies, pastry, candy, desserts, and sauces. Below are a few examples from this bounty of recipes. 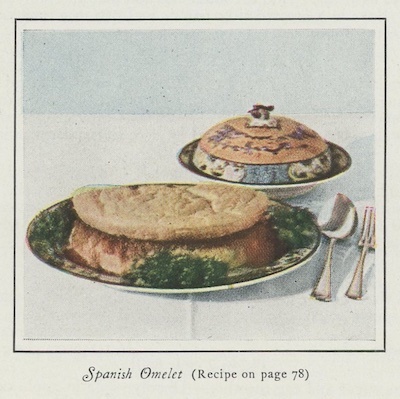 This excerpt includes a Spanish Omelet, a recipe I almost made for this blog. 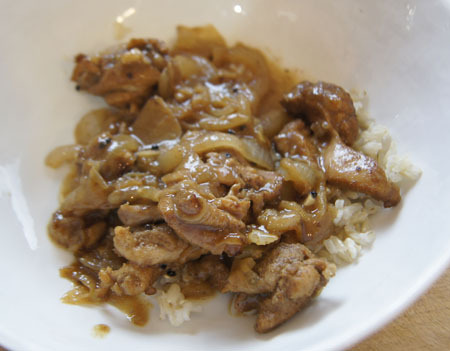 These recipes are for main dishes. These are classic cookie recipes, especially the Hermits (a dark spice cookie filled with fruits and nuts) and the Oatmeal Cookies. 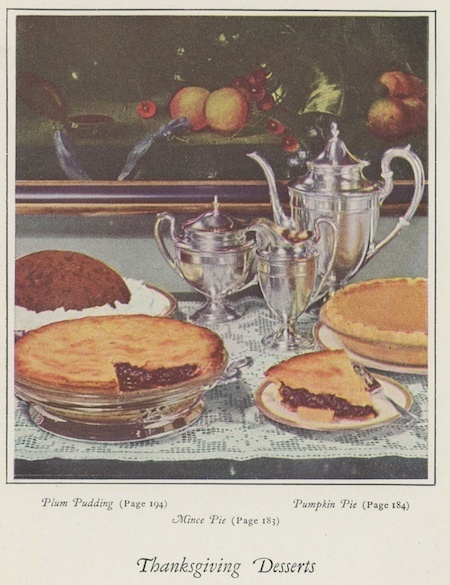 Here is one of the color photos: Thanksgiving Desserts. 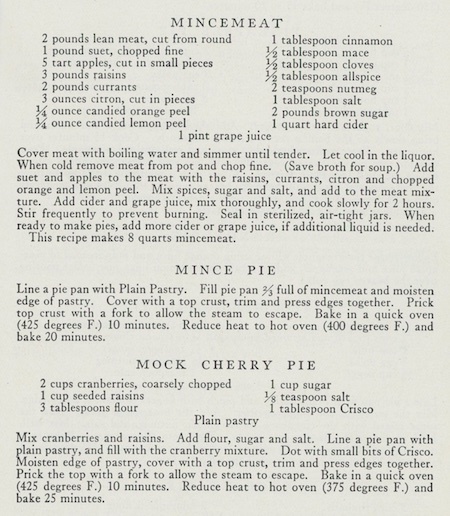 My mother’s pie crust recipe is almost just like this one below – except her recipe specifies the amount of cold water. She specified Crisco brand shortening in the recipe I got from her. After the recipes, the last few chapters cover large quantity cooking and menus for all occasions and reference tables and charts. 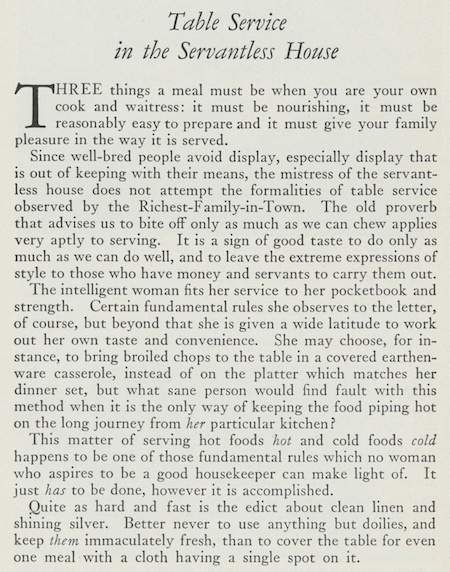 And The Art of Cooking and Serving ends with a very helpful index. There really are a lot of recipes I could choose to try for this blog. So many in this book are good, homey, from-scratch recipes! 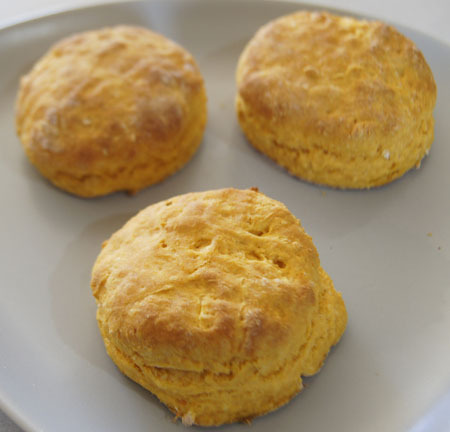 I decide to make Sweet Potato Biscuits. I think this is an amazing recipe. For one, it calls for 1 1/2 cups of sweet potatoes – and that’s a lot! And it calls for only 2 tablespoons of sugar and 3 of shortening. I think the 2 tablespoons baking powder might be a bit much, but I stayed with that original amount. I am going to use my immersion blender to mash the sweet potatoes with the milk, and my food processor for the flour and shortening. Otherwise, I am staying with the original recipe. 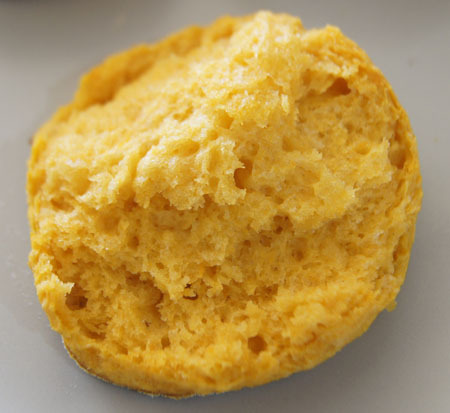 Put the flour, baking powder, sugar, and salt in a food processor. Pulse for about 2 short pulses. Add the vegetable shortening and pulse for 4-6 short pulses. Pour the mixture into a bowl. Mash the cooked sweet potatoes with a fork enough to measure 1 1/2 cups. Add the 3/4 cup milk. Mix well: I used my immersion blender, but an electric mixer or food processor would also do the trick. Add the sweet potato mixture to the flour-shortening mixture and stir with a big spoon. This is a soft, wet dough. The next step is to roll the dough out on a floured bread board. I got my hands into the dough mass to make this transfer, adding a bit more flour so it would not stick to my hands. It was a bit messy. Press the dough out until it is about 1/2-inch thick. I found that I did not even have to use my rolling pin to get it to this thickness. 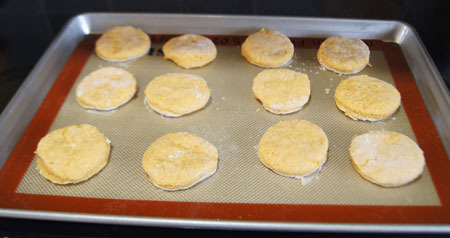 Use a biscuit cutter to cut out the biscuits. I actually had exactly 16 biscuits! 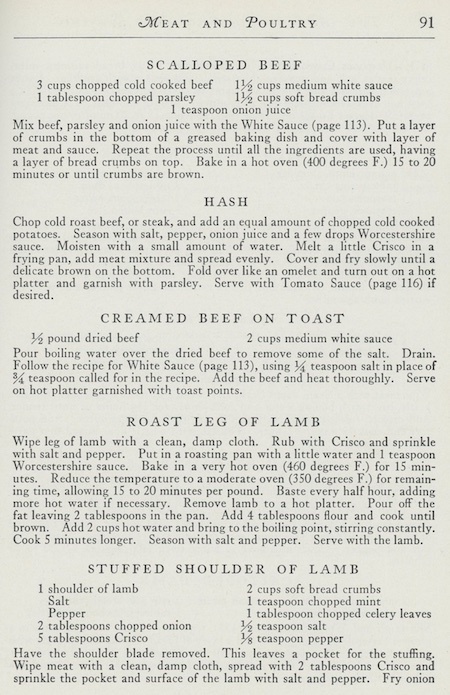 Bake at 425˚ for 15-17 minutes, until lightly browned. My daughter and I really loved these. Hubby avoided them – he isn’t a sweet potato fan. His loss. And more for us! This was definitely a successful recipe. 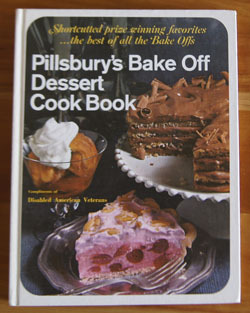 Sometimes it’s a good idea not to throw out those old cookbooks! I had fun exploring The Art of Cooking and Serving. 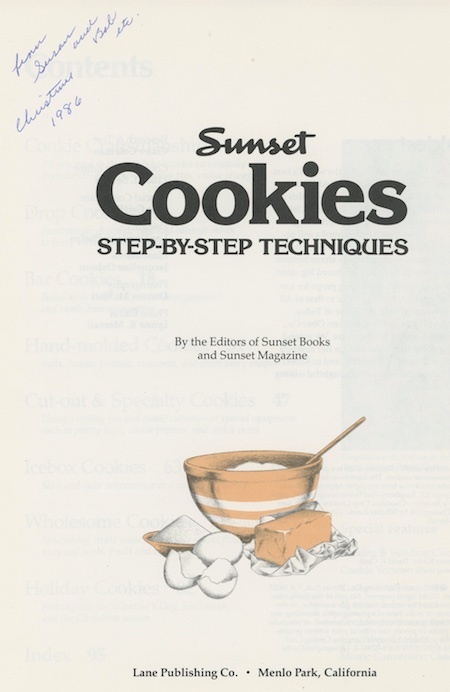 Cookbook #245: Cookies, Step-by-Step Techniques, the editors of Sunset Books and Sunset Magazine, Lane Publishing Co., Menlo Park, California, 1985. 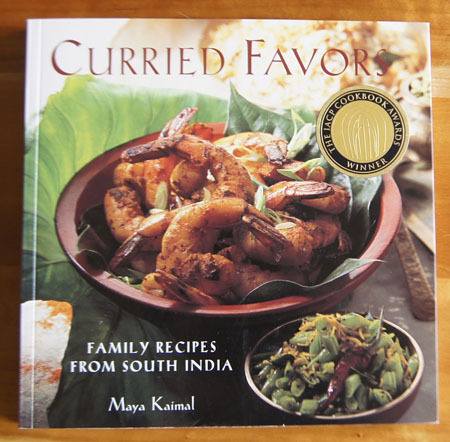 I’ve saved this book for one of my last entries for this 250 Cookbooks blog because it is special to me. It was my mother’s, given to her by my brother and sister in 1986. Her notes are in it, some pages are stained with food, and many pages are falling out of the binding. I just love it! I like cookies, any time of the year. But especially at Christmas: I used to make tons to give away. Of my 250 cookbooks, 8 are specifically “cookies”. And if you look at my recipe index, you will see how many favorite cookies I have. Although I only rarely make cookies these days, it doesn’t mean I don’t like them! Sunset put together a good collection of cookie recipes in Cookies, Step-by-Step Techniques. I page through carefully, admiring the photographs and looking for the recipes that Mother marked, and looking for ones I’d like to try. 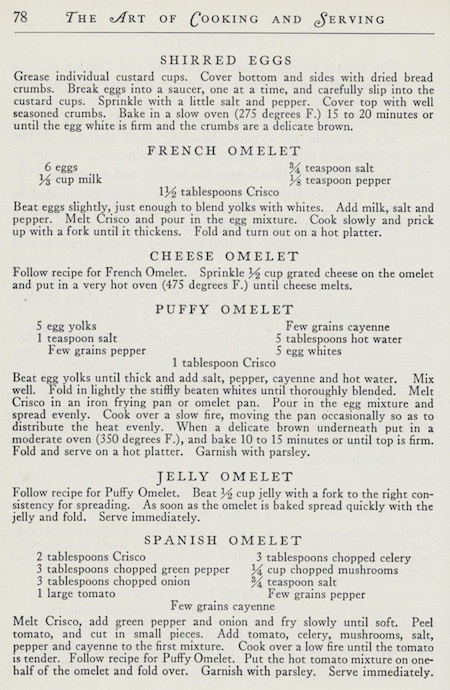 Actually, almost all of the recipes sound very good. “Brownie Date Drops” are marked “very good”. 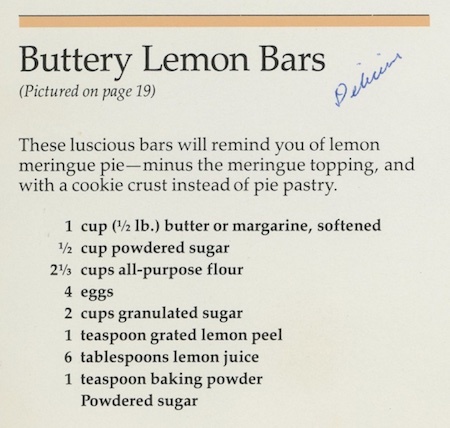 She marked “Coconut Macaroons” as “not special”, and “Buttery Lemon Bars” as “Delicious”. “Dream Bars” were “Delicious“. That underline means extra delicious! I smile at all of the food stains on the recipe (below). “Peanut Blossom Cookies” are marked “Delicious”. It differs from the recipe I already posted for Peanut Blossoms by having a little more peanut butter (1/2 cup) and a little less flour (1 1/3 cups). 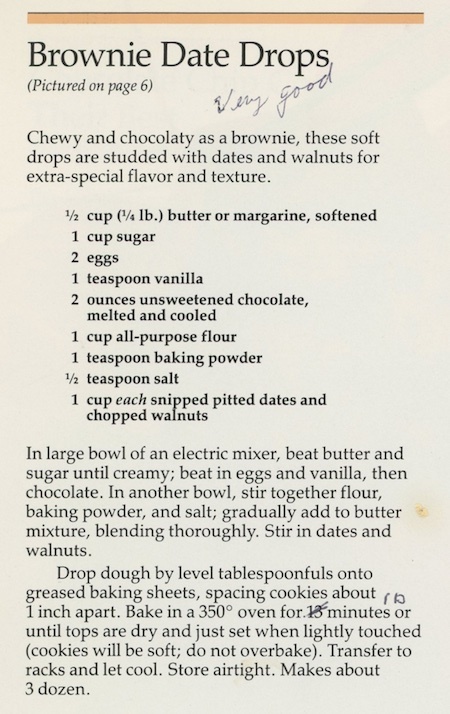 Peanut Blossoms are also in my Hershey’s Chocolate Cookbook, published in 1982, and in A Treasury of Bake Off Favorites, published in 1969. I note the “Chinese Almond Cookies” to try, as well as “Old-fashioned Molasses Chews”. “Date-Oatmeal Cookies” are marked “not great”. I’d like to try the recipe for “Fruit Bars”, because they look like fig newtons. 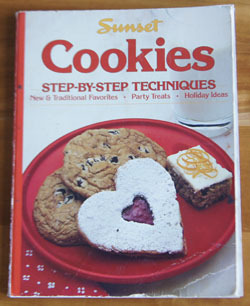 The chapter I focus on for a recipe for this blog is “Wholesome Cookies”. We try to avoid cookies these days (calories), so if I do make them, I try to use a recipe that contains a lot of nutritious ingredients. 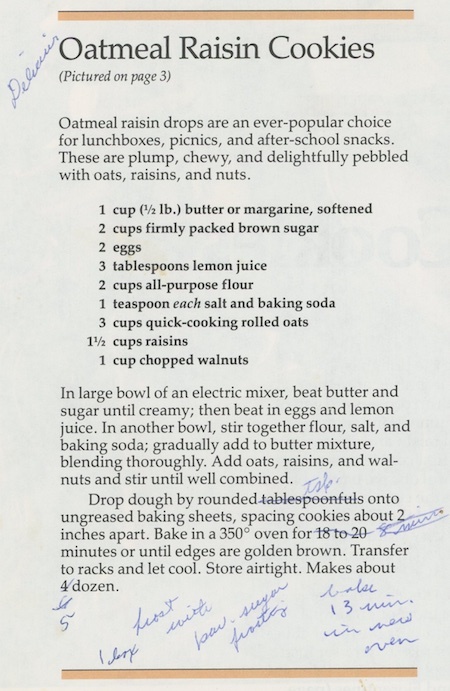 I like the “Half-cup Cookies” – they call for 9 ingredients in the half-cup quantity: butter, peanut butter, brown sugar, honey, chocolate chips, nuts, coconut, raisins, and granola. The flour in Half-cup Cookies is whole wheat. 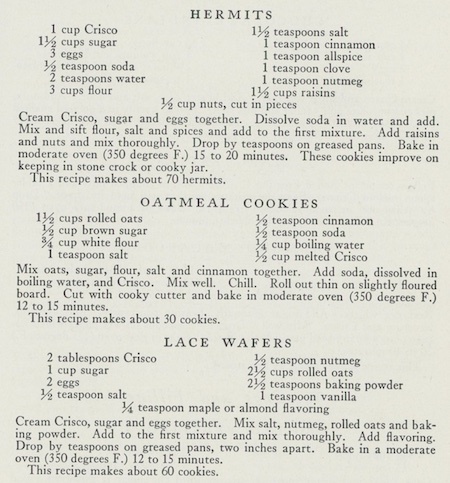 Other cookies in this wholesome chapter include many of the half-cup ingredients, plus fructose (sweeter than sucrose, table sugar), bran, carob chips, wheat germ, and tahini. 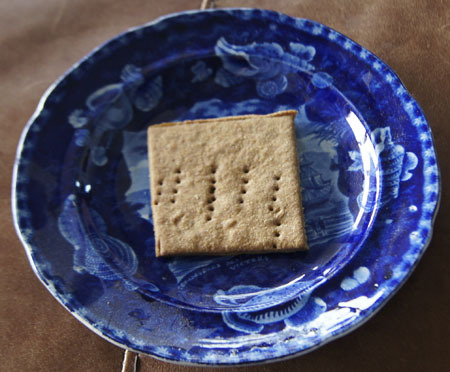 I am tempted to make Half-cup Cookies right away, but instead I choose the recipe for Graham Crackers. Why? Grandson visiting. He loves to roll out dough, and we all want him to eat foods that are sort of healthy. These graham crackers are made with whole wheat flour and wheat germ and honey, and contain less sugar than most cookies. Plus, I can mix them up the day before, making less work for what will surely be a busy day. The only change I made to this recipe is how we rolled them out. I like to use half-sheet pans lined with pre-cut parchment paper for baking cookies. So we rolled out the dough directly on to a piece of parchment and then carefully transferred the paper and dough to a half-sheet pan. In a mixer, beat together the butter, honey, brown sugar, and vanilla until creamy. Stir together the flour, wheat germ, salt, cinnamon, and baking powder. 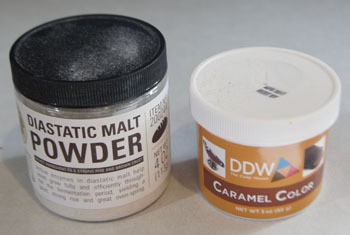 At low mixer speed, add the flour mixture to the creamed mixture alternately with the water. Wrap the dough in plastic or put in a sealed storage container and refrigerate at least 1 hour or up to 3 days. Divide the dough into 2 equal portions. Place one portion of dough on a lightly floured board and press it out as much as you can with your hands. Transfer the dough to a piece of parchment, pre-cut to fit a half-sheet pan (a half-sheet pan is the same size as a cookie sheet). Roll the dough until it goes just past the parchment. (This is tough work! My dough was very stiff. But between the two of us, we got the dough all rolled out.) 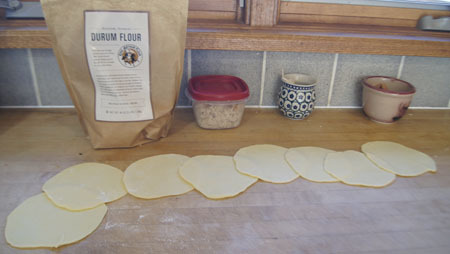 Trim the dough to match the parchment. It will be about 1/8-inch thick. Transfer the rolled and trimmed dough and the parchment to a half-sheet pan or to a cookie pan. Cut the dough into 3-inch squares. We used a pizza cutter (a pastry wheel) and my quilter’s long straight edge tool. Then, poke each “cracker” 3 times with a fork. Note: Easier way to roll out dough! I baked the second half of the dough a week after the first batch. The dough was very, very stiff, so I heated it in the microwave. It rolled a lot easier! I don’t think the “refrigerate at least 1 hour” step is necessary. Another trick is using a silicone half-sheet liner (I just bought my first Silpat®). 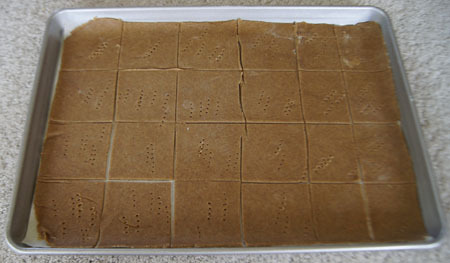 The Silpat® was stiff enough to allow me to transfer the cut crackers easily to the half-sheet pan. Bake at 325˚ for 20-30 minutes. The cookies are done when lightly browned. You might find the crackers at the edges of the pan getting too brown (mine did), so remove edge crackers when necessary. 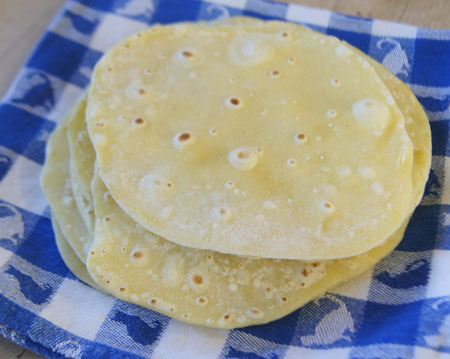 Start checking and removing browned crackers at 20 minutes. Oh yes, there are not just 3 fork pricks in this cracker! Practicing “one-two-three” with a 4 year old sometimes doesn’t work. But who cares? These were actually delicious, although not all the adults liked them. I thought they were even better the next day, but I doubt the rest of the batch lasted that long – my grandson made sure that he put all his crackers in a bag to take home. I saved this one cracker in the photo above to be sure I had one to take of picture of the next day. Then I ate it! Successful healthy graham crackers! And a lot of fun. I gave Dzo a tiny child’s camera (that really works!) 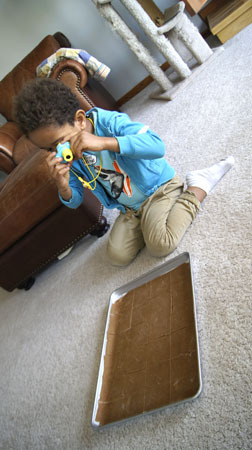 and he took a photo of the pan of cookies too. Cookbook #244: From Julia Child’s Kitchen, Julia Child, Alfred A. Knopf, NY, 1975. Second printing, 1982. Hardcover edition. “I smile warmly at Julia Child’s complete love of cooking”. These words were mine when I explored Mastering the Art of French Cooking. And I again smile as I open From Julia Child’s Kitchen. Fourteen years passed between the (initial) publication of these two books. In 1975, Julia Child has a successful television series and is world renown. And she hasn’t lost her love of cooking. 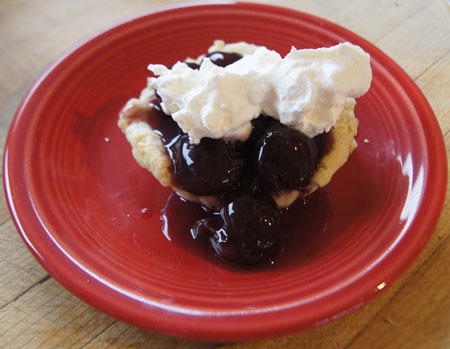 That love bursts from the pages of From Julia Child’s Kitchen. And the photographs! Her husband’s stunning photographs and drawings grace the book. Let me share the first paragraph from the introduction. It’s a perfect illustration of what the book is about and Julia’s style of writing. 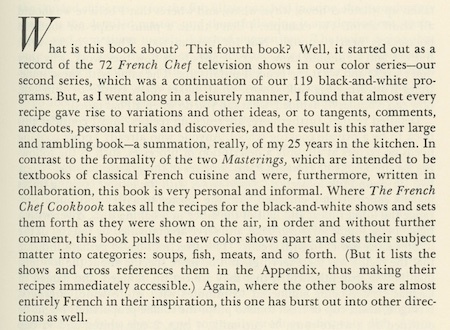 From the above excerpt, we learn that Mastering the Art of French Cooking was written as a textbook, a complete guide, and was written as a collaboration. I used to be a bit intimidated by that first tome. (Now I totally enjoy it!) From Julia Child’s Kitchen is less serious and more fun. Sure, it includes all the important methods of preparing soups, poultry, meats, egg dishes, quiches, homemade sausages, fresh vegetables, French breads, pastries and desserts. But it focuses on the American home cook, with recipes that can be made in a reasonable amount of time and with any level of cooking skill. 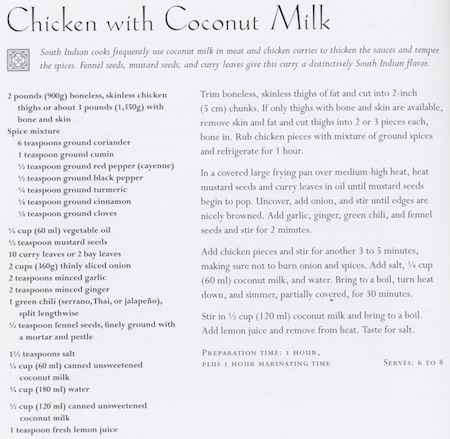 From Julia Child’s Kitchen also has a chapter on “earthy alternatives”, such as lentils, beans and rice. I find most of the recipes a bit less calorie-laden than in her previous book. And, there are cartoons throughout. Every chapter and many recipes begin with memoirs of her experiences and travels. Also intertwined are references to her television shows in the 1970s and 1980s. Often a recipe expands on a recipe from a half-hour show that didn’t have time to give all the alternatives. See how I get caught up in this book? Julia goes on to write that she contacted the daughter of Caesar Cardini to get the original recipe for the TV show and for From Julia Child’s Kitchen. 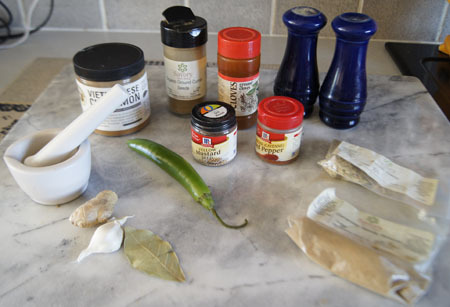 Accordingly to Julia, anchovies were not in the original recipe; instead, Worcestershire sauce was used (Worcestershire has a “speck” of anchovy in it). The Joy of Cooking recipe only differs from the recipe in From Julia Child’s Kitchen in the anchovies and the inclusion of a little wine vinegar along with the lemon juice. Potatoes sautéed in a stove top pan is a staple at dinners at our house. I never use a recipe, just throw them together. It might be good for me to take some time studying Julia Child’s methods, because sometimes mine turn out good, and sometimes disappointing. And I can compare her recipe for the pressure-cooked version with one I tried previously for this blog entry: Country Style Potatoes. “Egg Dishes” catches my eye. Remember when I discussed how to boil an egg in Kitchen Science? Well, Julia Child uses the same method. Her discussion of hard boiled – or HB – eggs covers 8 pages! I use a push-pin to poke a whole in the egg, but she actually had an egg-pricker. (They even sell complicated egg prickers online these days.) Continuing with eggs, we come to poached eggs. I use silicone cups to hold eggs to “poach” them in boiling water, but true poached eggs are made by sliding a cracked egg directly into boiling water. She calls poached eggs the “purest and loveliest of ways to cook eggs. I have tried the method of poaching eggs directly in boiling water, but was never successful. But this morning, I carefully studied Julia Child’s method and on my first try, successfully made 4 poached eggs! They were almost perfect! And definitely yummier than the silicone cup method. At first, I kind of want to make Julia’s Garlicky Sautéed Potatoes for this blog. 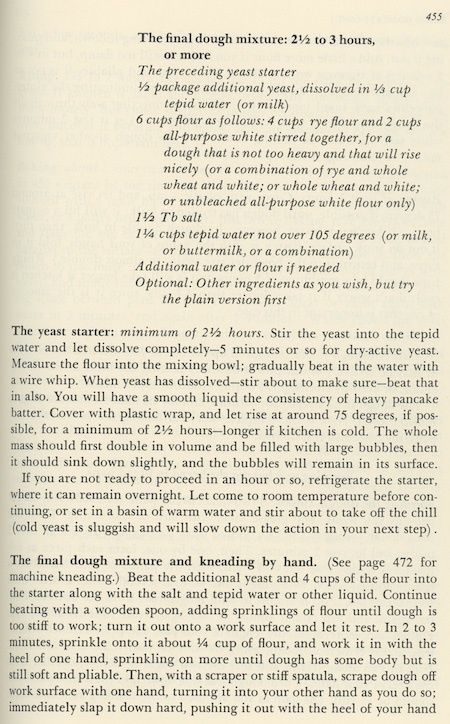 But then I came across her recipe for Rye Bread. 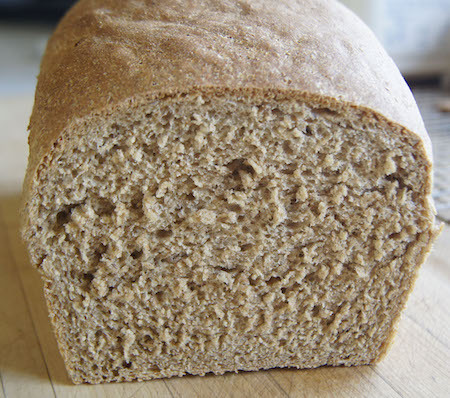 I have a lot of rye flour in my pantry that I should use up, and rye flour is a whole grain flour and thus “good for us”. So I decide to try the rye bread first, and then the potatoes some other time. 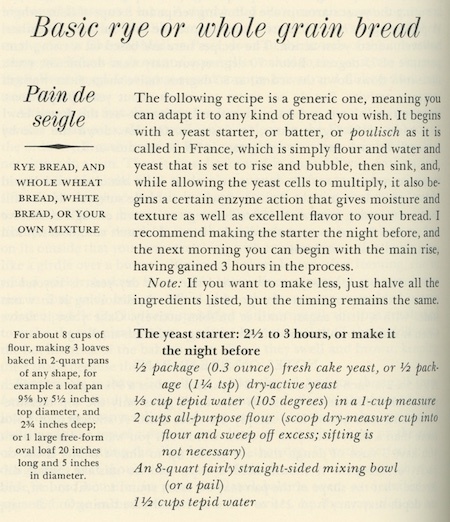 Below are the first two pages of Julia Child’s recipe for rye bread. The entire recipe goes on for another five pages! It is just lovely and bubbly and has a wonderful yeasty sour smell. 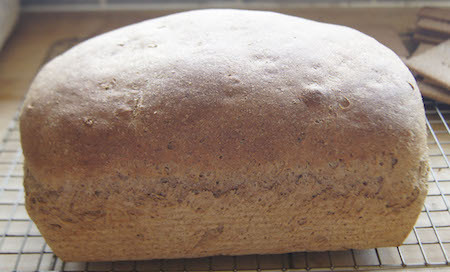 Put all of the ingredients except the caraway seeds into the bowl of a bread machine. 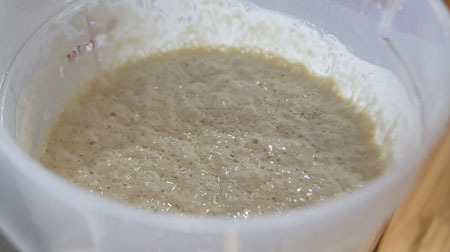 Set to a dough cycle that includes a rising step. Start the machine, and monitor the dough a bit to make sure it is forming a big ball of dough. My dough was pretty sticky, but I didn’t add any more flour. From experience with my bread machine and my yeast, I know that a heavy dough like this will give a better rise and texture if left sort of sticky to the touch. Add the caraway seeds when the machine beeps that it is time for such ingredients, or fold it into the dough when it is finished kneading and rising. When the dough cycle is complete, remove the dough to a lightly floured board. Fold and press the dough for a minute or so, then form it into a loaf and place it in a lightly greased 9/5-inch loaf pan. 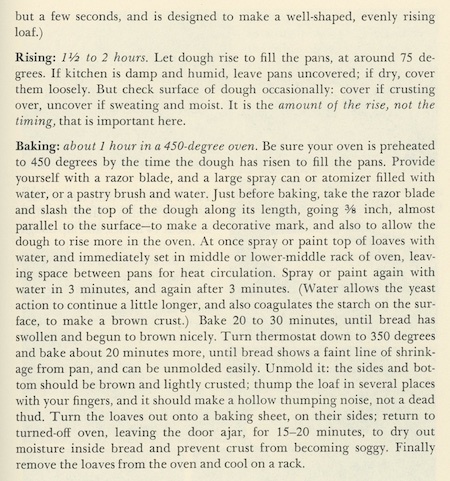 Bake at 375˚ for 25 minutes, then turn the oven to 350˚ and bake another 7-10 minutes, until the top is nicely browned. When done, it should sound hollow when tapped. Here is my loaf. In my opinion, the amount of dough was a bit too much for the pan, but I would not change this in the future. 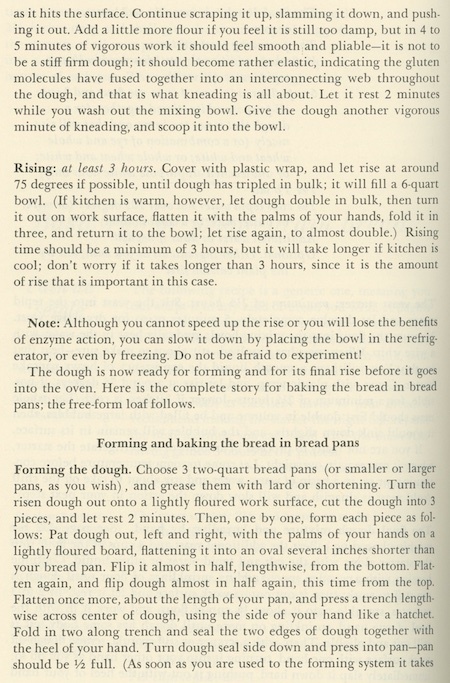 If you like, experiment with free form loaves as in Julia Child’s original recipe. The texture was a tiny bit moister than my usual whole wheat bread. But, it was entirely delicious! It stayed together as a slice, but was soft and yummy tasting, especially with corned beef or pastrami on it.